Hi I am Shannon from Coupon Savings In The South. I wanted to stop by and share one of my favorite recipes. 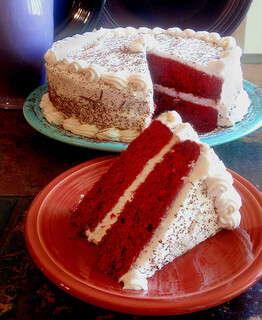 Here is a recipe for Red Velvet Cake. Mix sugar and oil together; add eggs 1 at a time and mix well. Add flour alternating with buttermilk (baking soda is added to buttermilk). Mix well. Add vanilla and food coloring. Pour into greased and floured pans cook at 350 for 20 minutes or until a toothpick comes out clean. Mix cream cheese, margarine, and 10 x sugar until smooth. Add vanilla and chopped nuts. Spread over the cool cake layers. I can’t believe I have never made one of these! I’m going to do it! Thanks for the recipe. It looks so pretty!